Enjoy a fabulous special wine dinner at Sylvia’s Restaurant. Mon 6 May - George Clayton Park Amazing food, music, rides, displays, raffles, competitions and much more. Learn to create ceramic pieces with famed Brisbane ceramicist Tracy Murray. Refreshments provided. Wynnum Wading Pool 5km FREE timed run along the Wynnum Manly foreshore. FORT LYTTON NATIONAL PARK EVERY SUNDAY FROM 10AM Free (donations invited). Historic military fort; military museum self and guided tours. birthday celebrations and corporate-events. It is perfect for a casual party vibe! So, If you’re looking for a great place to EAT, STAY and PLAY … look no further! www.waterloobayhotel.com.au for further details. Inspiring a love of dance! Dance classes for ages 2 to adult. Looking for a great place to EAT, STAY and PLAY…look no further! makeover adding a kid’s corner, dungeon and horror room plus chairs for browsing. Autumn Fashion options are plentiful with new ranges in at SOBIDAH CLOTHING; LEWIS & PHILP; SIMPLY BELLA; JUICY SECRETS AND GOT-A-GO boutiques. And the men aren’t forgotten at DBS MENSWEAR. Look out for WYNNUM UP LATE in May…a great opportunity for a Fabulous Friday Fun shopping night out complete with Fashion Show from SOBIDAH CLOTHING. Perfect for Mother’s Day gifts on Sunday 12 May. Thanks for additional news from WYNNUM CENTRAL. VisitWynnumManly.com INTERIORS | Design, decor, plants, furniture, lighting, art, gifts & creative ideas | STYLE & decorating SERVICES | SHOP our Brisbane Store or ONLINE. "we didn't invent fashion just tailor it to you"
Run a business in Wynnum or surrounding suburbs? BAYSIDE SLEEP HEALTH Difficulty initiating or maintaining sleep? Restore good sleep health with evidence-based, behavioral treatment for insomnia. One-stop-website for ALL the visitor information on Brisbane’s Bayside - Wynnum Manly! To keep up to date on updates on events, news, and offers, sign up to our e-news, like our facebook page or follow us on Instagram. You can also pick up a Visitors Guide at the Manly Tourist Information Centre. MATES RESTAURANT & BAR has opened in Edith Street with the aim to offer customers good quality food. Try their specials available throughout the week with the Monday night deal of two main meals and two drinks for two people for just $50. SYLVIA’S RESTAURANT at SHANGRI-LA GARDENS in Wynnum West is celebrating their new Autumn menu with one person eats for FREE for groups of four or more on a Saturday night. Book early also for Mother’s Day breakfast on 12 May and a wine dinner on 7 June. WYNNUM GOLF CLUB is another great option for Mother’s Day Dining or any weekend with its beautiful views over the fairway from the Clubhouse. FIG RESTAURANT & BEER GARDEN at the WATERLOO BAY HOTEL have weekly specials throughout the week from Mad Mondays to Tight Tuesday with live music at the weekend. A great alfresco spot for Mother’s Day. Looking for something different for Easter? CULTIVATE DESIGN CO in Bay Terrace has Mayfield Chocolates, multi-award winning fine chocolates. MATILDA’S GELATO in Edith Street has a range of delicious gelatos and cakes – including chocolate of course - with great value take home tubs. Down by the Foreshore PELICANS NEST is serving coffee from 6am. MATILDA THE ART OF GELATO Artisan gelato with lots of dairy free and gluten free flavours. Range of Gluten free sweets, coffee , green lattes, Italian chocolate and lots more! Italian delicatessen to gift also available. INDIAN SPICY VILLA Authentic Indian Food. All dishes are 100% home style with the best ingredients and finest spices from around the world. SHANGRI LA GARDENS We have a function venue to suit every requirement, from intimate gatherings to grand occasions! We can save your business $5000*. * Based on an analysis of your business accounts and tax structure. CENTRAL BUSINESS ASSOCIATES has partnered with Beakyn Advisory & Coaching Services to create a comprehensive Leadership Masterclass Program. Giving you short, sharp hands-on tools & strategies to improve your performance in Time Management, Emotional Intelligence, Change Management, Communication, Strategic Planning and Accountability. Call Celia on 07 3180 1615 for more details. 2019 WYNNUM BUSINESS Meetings are held throughout the year and available for Wynnum Business members and non-members. Go to the Wynnum Business Facebook page for more details. CENTRAL BUSINESS ASSOCIATES Wynnum Central Train Station Map for illustrative purposes only The Wynnum View is produced by Leaping Solutions 0408 726 068 | Main Photograph credits by Bayside South Development Forum | Copywriting by Kevin Liepins, Leisha Robertson and advertisers | Typesetting and layout by SteinArt Graphic Design 0408 027 699 | Printing by Harding Colour 3907 6500. Whilst every effort has been made to ensure the accuracy of this publication, the publisher accepts no responsibility for any errors or omissions which may be contained herein. Flexible Workspaces with Ocean Views. Coworking, Boardrooms, Offices. Community, Collaboration, Connection. Work close to home, not at home! 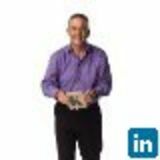 Reliable, friendly, expert advice on all your commercial property needs in Wynnum and Manly. Rachael Scherlies mortgage broking service is second to none. At Smartline, we work with our clients to ensure they choose the right mortgage and the right lender to suit their needs. Move to a local bank. Full banking products and great personal service. 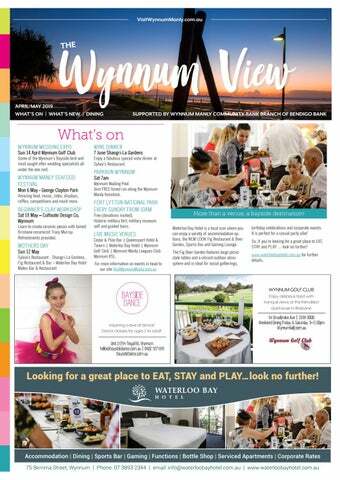 What's On, What to Do News & Dining in Wynnum on Brisbane's beautiful bayside.